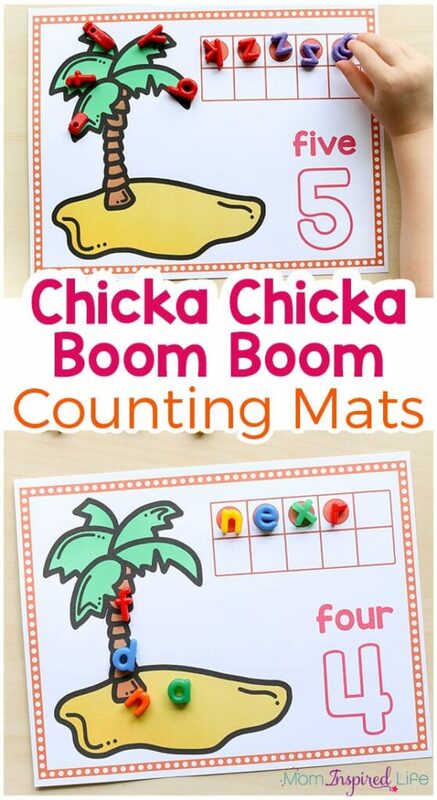 I just love these Chicka Chicka Boom Boom Counting Mats! They would be a great math activity for your Chicka Chicka Boom Boom lesson plans or even just for fun with your kids this summer! The book Chicka Chicka Boom Boom by Bill Martin, Jr. and John Archambault and illustrated by Lois Ehlert is a favorite amongst teachers and parents. I remember my kindergarten teacher reading it to me, I read it in the classroom to my students and now my own kids enjoy the book too! 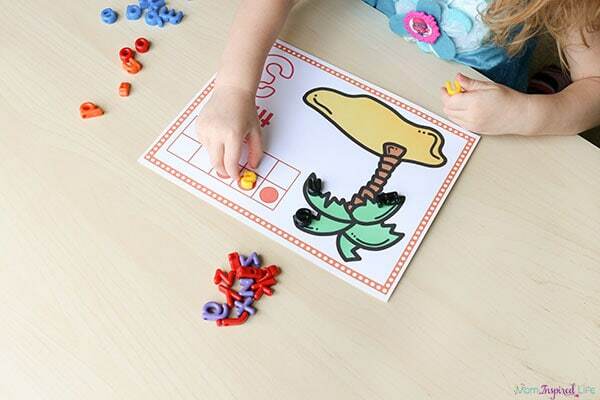 It is perfect for summer or the beginning of the school year, so I figured now would be a great time to do a few Chicka Chicka Boom Boom activities with my preschooler. The book is a great way to introduce young children to the alphabet. 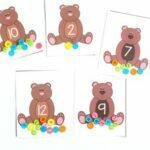 There are many alphabet activities that go along with the book, but these counting mats combine both math and letter learning. Win-win! In the past we made this super cute Chicka Chicka Boom Boom snack, so we had to make that again too! We absolutely love these alphabet beads. If you read my blog frequently, we are probably familiar with them already since I use them all the time. 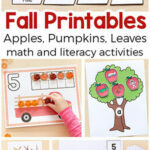 They are just super versatile and perfect for all kinds of preschool activities. They are definitely on my must-have list! If you are planning to use these with several kids, I would recommend that you slip them into these super handy dry-erase sleeves. They are so much better than page protectors and also top my list of must-haves for preschool learning. You could always laminate them too. 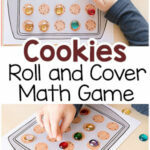 This math activity is a great way to integrate math and literacy. 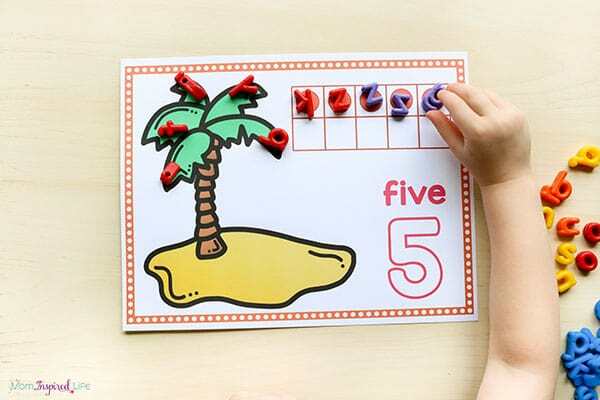 Children will engage with this popular story while also learning counting, one to one correspondence and exploring the letters of the alphabet. To begin, I read the story Chicka Chicka Boom Boom by Bill Martin, Jr. and John Archambault. 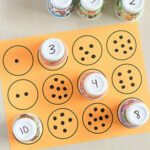 Then introduce the counting mats. Give each child a pile of alphabet beads – 10-20 beads each depending on the numbers you are working on. Then model how to use the mats. I like to have my kids put a letter bead on each dot in the ten frame first and then add the same amount of letter beads to the tree. 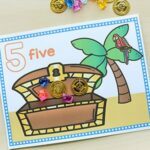 I even use these counting mats to work on addition with my 6-year-old son. He thinks of a way to make the number on the mat using beads of the same color. For example, on the mat with a number 9 on it, my son would decide that 5+4=9 and put 5 blue alphabet beads and 4 orange alphabet beads on the 10 frame. Then he might put 6 green beads and 3 purple beads on the tree. I always love it when I can find ways to make one activity work for kids with vastly different levels of ability! 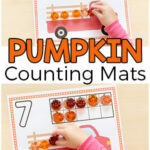 Check out these other fun counting mats!